Americans do not seem to realize that there is only one point to having a congress at all: The purpose of the US Congress is to serve as a translator for the public, to their government that was suppose to serve the people, and thereby the nation. Congress has no "other" purpose! I've been a vocal observer of this charade officially, for 44 years: during that time I have yet to see the needs of the public served, by the congress, or for that matter by any of the branches of government. What I have recorded have been the outright crimes and treasons, as well as tyranny's that this government has continued to do to the public: in the name of the public-essentially without any real consequences for the self-serving actions of this so-called government-whether in the name of setting polices or of creating "public standards." These corrupt figures have never varied from their practice of selling out the people for personal and-or political gain; just as the subject of all their actions (the public) have never failed to ignore the crimes and treasons that government has continually done to their willfully deaf, dumb and blind approach to everything political! To say this, is an understatement of the facts that does not come close to the obscenity which has passed for "politics in America" for all of the last forty-four years. However what is transpiring in Washington today is ground-breaking, in relation to their duplicity and their capacity for deception; not to mention their will toward privatized and personal Empire! The plight of the working people of this nation is an international disgrace. Our people have produced economic miracles in virtually every field, and yet they have never been allowed to share in any of the profits that currently flow directly from their labor and from the destruction of their own personal lives, all of which has been essential to the creation of this vulgar economic growth at the expense of everyone who worked to create this cancerous and outrageous financial anomaly. How could this happen? It was easy the public allowed the institutions of higher learning, the think tanks, the media and the government to publicly murder everything to do with being a "citizen," and to replace everything that a citizen might correctly expect from his or her government, with becoming a "consumer." A citizen has rights and expectations derived from their compact with the government, which the people created, to run the details of the life of their nation. A consumer has nothing to do with the functions of government; because being a consumer is to have become the digitized form of the end-product that has no meaning beyond the profit each item produced will yield to those who own the stock in whichever company is making that particular product. In a nation of consumers, the public is the collateral for the financial existence of the owners and their money; therefore consumers have no rights to anything at all! In fact it becomes the JOB of consumers to keep the game going full-tilt; because if the day ever comes when the consumer cannot consume: then the entire House of Cards will be gone with the first strong winds of autumn. This day, at the end of this first week of autumn, is here! There have been many warnings of dire things to come ­ this continual "If" ­ and many have been quick to shout when such things apparently did not materialize; however this is not one of those occasions. What sets this apart from everything else is that the so-called United States is trying to sell the world on the idea that "Hey - we're okay, we've fixed the problem!" Nothing could be further from the truth and the global community knows this all too well! For instance the world has noticed, even if the American public fails to, that whenever the public needs something like a living wage, or health care or real jobs; the government simply has no time for these things. But when the owners and their lackeys need something we virtually stop everything we were doing and begin to move heaven and earth (in SECRET of course), to give the real owners everything they want and more. What is criminal in all of this is that their "authority to DO anything at all comes from the same people which they have permanently barred from all of what they do that matters! An example is the language used in reaching their joint conclusion to this latest treason against the people and the nation: It is about to be suggested that the people will benefit by the government's stake in these institutions, as one of the ways that the public shall be protected-given the amount of tax dollars that are being stolen to allow all this to take place. The real problem is that 'the citizens' are no longer "the government" and the government has given us all over to the owners of the Federal Reserve, along with our tax money, to do whatever they need to do with that money: none of which shall ever be revealed to the public that will be paying for this hijacking for the next several decades! This matters to the wider world in the sense that the world KNOWS that the papers being shuffled about and traded, absorbed, and re- issued are all worthless-and that knowledge will very soon be registered when the true "worth" of the US dollar begins to appear in the world's financial transactions-not as this might still be today, but as its tangible worth really is; which is dropping like a rock around the planet! This will be the CRASH that finally ends it! "America is dead and broken, long live the Empire!" If you want to take back your country then stop swearing allegiance to being a consumer, cut up those credit cards and tell those companies they can get their money from the government that has given itself away to the owners of the Federal Reserve and that have just stolen everything you've worked for all your life! 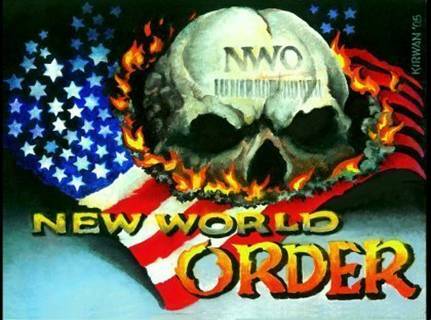 Welcome to the New World Order-where 'resistance' is always futile! Our "Surrender" may have been negotiated, but we can still disavow those that say they speak for us, provided that we do this with finality!